Team manager Alan Stubbs hopes the second phase of a share issue aimed at giving fans at least 51% of club shares can take Hibernian to a new level. The first phase last year raised around £500,000 and took the fans' ownership from just under 2% to just over 20%. Their launch of the second phase came the day after a blow to their promotion hopes with a 3-0 home loss to Morton. "This is another opportunity for the fans to invest and take the club to another level," said Stubbs. "They have seen the benefit of that on the pitch. "It's very important as a fan that, if you're investing in a club, you want to see it moving in the right direction and I think why it has been so successful is that they can see the ground we're making on the pitch." Wednesday's surprise defeat by the visitors from Greenock leaves Hibs eight points behind leaders Rangers in the race for the one automatic promotion spot in the Scottish Championship. Asked if Hibs would have to win all 11 of their remaining league games to have a chance of the title, Stubbs told BBC Scotland: "From that point of view, nothing changes. "It just makes it more difficult to win automatic promotion." With only the champions assured of going up, the three teams below face a series of play-offs before a final against the side finishing second bottom of the Premiership. "I've said all along we want to go up automatically," said Stubbs. "If not, we'll try to do that through the play-offs." 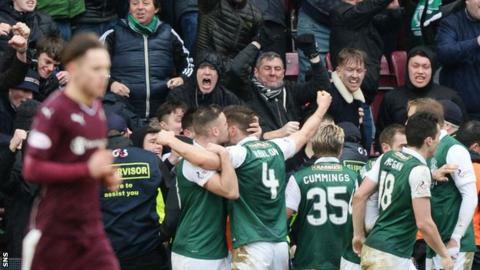 Although Hibs have beaten four top-flight sides in cup competitions already this season, Stubbs was reluctant to comment on how confident they could be of winning any play-off. "I'll probably answer that question a little later in the season," he replied. Stubbs says they will try to ensure the title race is still alive ahead of their final league meeting with Rangers, which will be rearranged for a date in April from 7 March with both teams in the Scottish Cup quarter-finals that weekend. The good news for Stubbs is that, regardless of what conspires at the end of the season, chief executive Leeann Dempster has stressed that all the money raised from the share issue will go towards the continued development of the football department. "We always said it would support the club's sporting ambition," she said. "Supporters often ask what that means, but for me it's about the players we have in our squad, about the players we want to have in our squad in transfer windows to come and it's about the financial stability of the club."